Earlier this year, we decided to tie the knot between Xero’s beautiful accounting software and Expensify. Xero’s cloud accounting software provides business owners with real-time visibility of their financial position in a simple, smart and secure way. Those of you who are familiar with the integration will know the highly customizable features we released earlier this June, but we’re not done yet! We’ve got a whole new slew of features to share with you. We know love is in the eye of the beholder, but whether you’re just learning about this union, or are a long time fan, we think our newest features make using Expensify with Xero even easier on the eyes. First, our two-way reimbursement sync means after reimbursement, whether via Expensify or otherwise, Expensify reports and Xero bills both automatically update. Recently, Xero released a new billable expense feature that helps track and keep financials in the black. We’re a big fan of helping business with tasks that easily slip through the cracks and decided to ease the process even more. 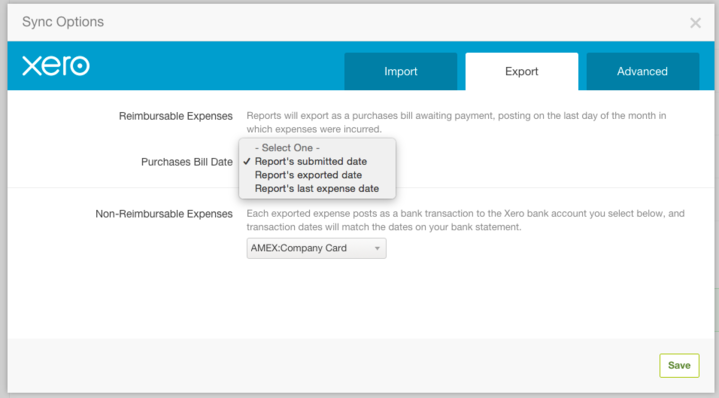 Expenses marked as billable in Expensify are now automatically available for selection in Xero for sales invoices. This makes it effortless to re-bill those expenses at a later date. Lastly, you can now also choose the date of purchase bills. Exported bills can be marked as the date the report was exported, approved, or had its last expense added. When you’ve ready to view it on Xero, all the relevant details are already included. We hope that these new features bring an end to manually checking details one by one. Instead, you can move forward with your day with the confidence that your financials are accurate and updated. Marketing @ Expensify, 20 something year old who likes things and stuff. In search of a better vocabulary.